Dual Relief Formula For Toothaches, Gum And Other Mouth Pain. 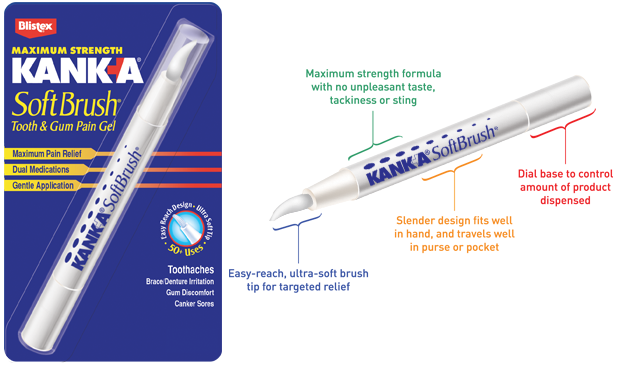 Kank-A® SoftBrush® is the first oral pain treatment to deliver medication in a unique, self-contained brush-tipped dispenser. This breakthrough allows users to comfortably and precisely apply medication in the hardest to reach areas, including between teeth and around braces. The sleek, pen-like applicator makes it easier than ever to target pain. The no-drip, ultra-soft brush applies the pain-relieving gel evenly and directly to sore areas, but has a comfortable touch that won’t irritate or aggravate the area. SoftBrush delivers medication in a mild, pleasant tasting gel to treat pain caused by toothaches and minor irritation of the mouth and gums, including irritation from braces, dentures and other orthodontic appliances. The dual relief formula contains a maximum strength anesthetic combined with an active oral astringent for fast effective relief.